Giving makes the world go around, and the most unique, irrevocable gift is time. National Volunteer Week - April 15 - 21, 2018 - is the annual opportunity to thank all volunteers who generously share their time, treasure and talent. A very special Thank You to the many CCAE volunteers who make possible the work of Canada’s educational advancement association. View the list of 2017 - 18 CCAE volunteers, and thank them for their generosity when your paths cross. Just one CCAeLearning webinar left! The final CCAeLearning session of the 2017-18 season takes place on Thursday, April 26. Kirsten Eastwood, Executive Director, Community Development at Toronto Montessori School will talk about Knowing, growing, building our significance: Using strategic engagement to advance a culture of giving. Thanks to webinar series sponsor, iA Financial Group, and this webinar sponsor, Ross W. Marsh Consulting Group Inc., this session is free for CCAE members to participate (all advancement staff at your school). Among the multitude of reasons to participate in #ccae2018 are at least 900 learning objectives the professional learning sessions promise to fulfill. These form part of the session descriptions on the CCAE website. Register by May 1 for the early registration discount, and for best value, bring a buddy from your school (who hasn’t attended in the past 3 years). The ultimate yearly event designed specifically for Canadian annual giving professionals is coming to Toronto in October 2018. Consider submitting a presentation proposal if you have innovations to share or topics you want to brainstorm with your peers. View the guidelines and submit your proposal here. 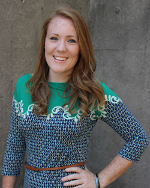 Meaghan Moore was a TD Insurance Fellow in Advancement from 2009 - 10 at Brock University. She stayed on at Brock as Young Alumni & Student Programs Officer and then as Alumni Engagement Officer until 2014. Since 2014, Meaghan has worked for TD Insurance, first as Manager, Partner Communication & Strategy; then as Manager, Affinity Marketing Enablement; and now as Manager, Affinity Strategy with the Affinity Market Group. Meaghan Moore: I worked my way through a variety of alumni roles at Brock, getting a really good breadth of understanding of alumni relations. In moving to TD Insurance and working on the affinity portfolio, I've gained a lot of experience with our alumni, professional and employer partners. I’ve worked on a number of large-scale marketing campaigns, and have had a chance to develop sales strategy within the affinity business. Meaghan: Having a background in Alumni Relations certainly was hugely beneficial in the career path that I've had at TD, and I never would have had the chance to grow within alumni relations had it not been for my Fellowship. I benefited from a breadth of learning and a portfolio of projects that may not have been afforded to me in a regular entry-level position. This enabled me to try on many different hats, and work in a variety of different areas over the course of the year to find my niche. The Fellowship also taught me the importance of networking; it created an immediate network of CCAE and other TDI Fellow contacts, which ended up being beneficial resources during that year, and continued to be resources as I grew within alumni relations. Even in my role at TD Insurance, I continue to meet former alumni colleagues from schools across Canada and am able to tap into that alumni perspective, because I understand that world. CCAE: What advice do you have for aspiring TD Insurance Fellowship candidates? Meaghan: Make sure that your Fellowship application has breadth of opportunity. Your institution will benefit from your breadth, and so will your career and the profession overall. The uniqueness of the Fellowship is that it provides a role where previously there would not have been one; so embrace that in your application and your plan for the year. Once you become a Fellow, make sure that you actively try to soak up as much experience as you can throughout the year, with a variety of projects. And network; take advantage of the prestige the Fellowship affords you, and the introductions to experts in advancement across the country. Karen Bertrand has been appointed Vice-Principal (Advancement) at Queen’s University. Bertrand has previously served as Associate Vice-President, Major Gift Advancement at the University of Guelph.